There’s nothing cozier than a warm, bright fire on a crisp autumn night. Unfortunately, every year at least 12,000 people are killed in residential fires in the United Sates, according to statistics from the National Fire Protection Association. Some of those fires are caused by fireplaces and wood burning stoves. Understanding and practicing the following safety tips will help keep those hearth fires glowing in a safe, controlled manner. Whether you are installing a stove or ensuring yours is properly installed, one thing to bear in mind is required clearances from combustibles such as furniture, curtains and even the house itself. The National Fire Protection Association (NFPA) standards call for a 36 inch clearance between a room heater stove and any combustible surface. This distance may be reduced with properly installed heat barriers such as sheet metal and brick. Check with your local Fire Department and your stove manual for proper reduced clearances. If air spaces are not maintained between the stove and the wood framing or the chimney flue and the wood framing a process takes place called pyrolysis. For instance, a normal 2 x 4 will spontaneously ignite at 600 degrees F., if the heating appliance is too close it will draw the moisture from the 2 x 4. When this happens repeatedly, the 2 x 4 can spontaneously ignite as low as 200 degrees F. Generally this happens in 3 to 5 years. So ensure you have proper wall and floor protection and required clearances. If you have a “0 CLEARANCE” fire place, be sure it has not been altered. This type is safe only if installed to the manufacturer’s specifications. Wood supply is another important factor. Green (moist wood that has not been allowed to dry out) wood should never be burned. It puts out less heat and more creosote. 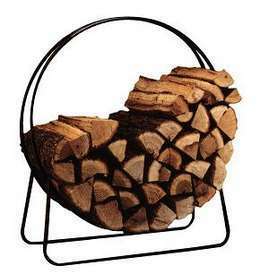 Split and stack wood and allow it to season (dry out) for at least six months prior to burning. Do not burn cardboard, milk cartons, trash, or artificial logs (unless specifically manufactured for this purpose) in your stove because this type of product burns extremely hot and can crack masonry and warp metal. It will be easier to maintain your stove with frequent additions of wood rather than infrequent additions of large amounts. To reload your fire box, open drafts for a few minutes, then open door slowly, add wood, close door and allow to burn hot for about 15 minutes, then return draft to desired level. By doing this you can reduce creosote build up by as much as 30%. Creosote vapors are produced when wood burns and condenses in the relatively cool chimney flue of a slow burning fire, these vapors collect on the inside of the chimney flue in the form of a charcoal called creosote. This build up is much more rapid in airtight stoves as the air flow is reduced. Reports of complete chimney blockage due to creosote have been found within 2 hours of installation. When a chimney fire occurs this creosote build up ignites and can cause temperatures of up to 2,000 degrees F. Chimneys are not designed for this temperature and damage to the flue can be the result. Learning how your appliance operates is an important factor in the safe operation. Experimenting with different woods and draft settings will give you a good idea of the most efficient combination, producing the most heat and least amount of creosote. It is also recommended you have your chimney checked/cleaned at least 2 times a year. Keep the area around the heating unit and flue clear. Most certifies appliances and municipalities have minimum clearance distances that must be met. Children MUST be supervised AT ALL TIMES when wood stoves are in use. Wood stoves should be safety tested and bear a label from a recognized authority such as a testing lab (ULC, CSA) or building code group (NFPA). Ashes removed may contain live coals. Never use a vacuum cleaner to remove ashes. Place ashes in a metal container with a lid. Then, remove it outside, well away from anything that can burn. Allow it to cool thoroughly before disposing of it. There’s nothing cozier than a warm, bright fire on a crisp autumn night. Use your wood burning appliance safely and enjoy the benefits of wood heat.